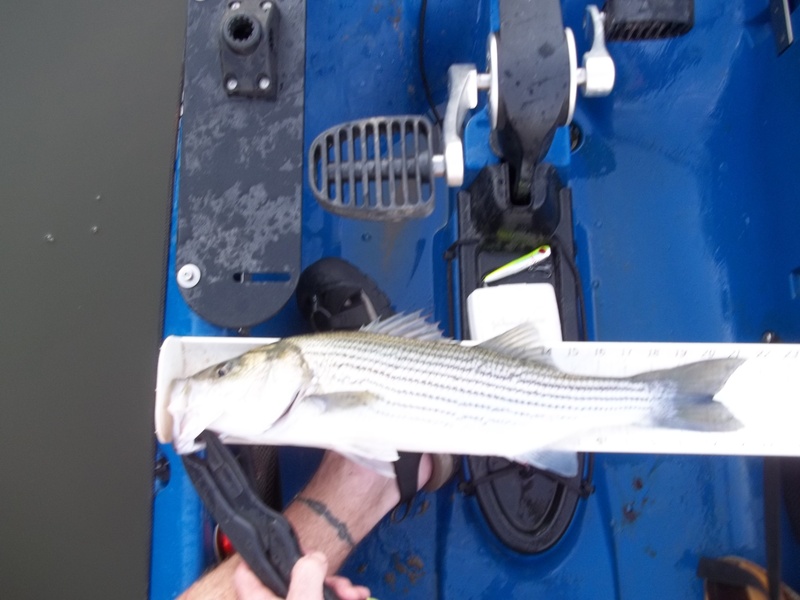 The nights have begun to cool in the southeastern states, and with the cooler temperatures, striped bass are starting to feed heavily again. I got out on the lake after work for a few hours the other day and decided to troll the shallows during the last couple hours of light. I found fish in less than 10 feet of water and they were ready to eat. I was trolling 1 rod with a #3 in-line spinner (unweighted), and the other rod was rigged with a Carolina-rig, equipped with a 1-oz weight (that rod I barely had any line out); this setup was rigged with a #5 in-line spinner. 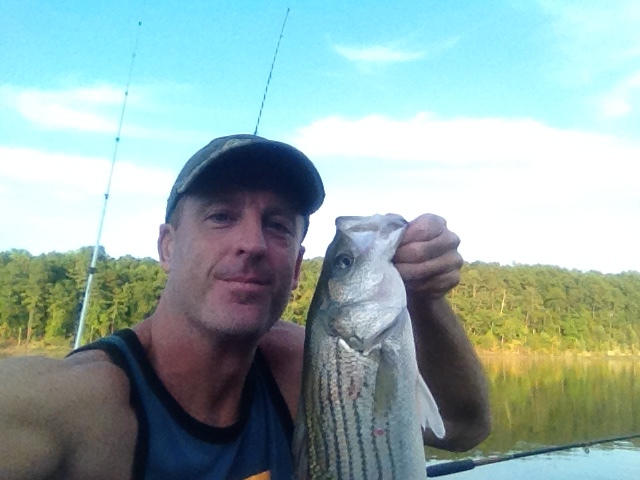 I found fish on one stretch of shoreline and literally caught a striper on every pass til I left at dark. 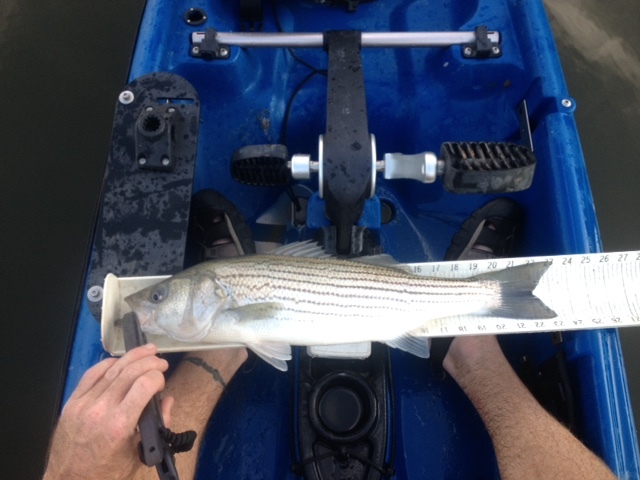 There were some shorts; from 17″ – 19″, but I also landed 7 fish in between 21″ – 23″. 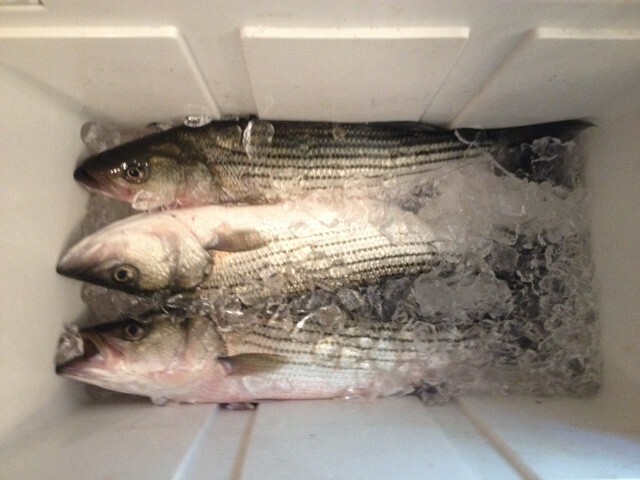 Keeper stripers for the lake are 20″ and up (there is no slot and 4 per angler is the creel limit). These fish fought hard and if you could see the time stamps on the digital pics you would see every fish was caught within 3 to 7 minutes of each other! I basically had enough time to reel in the fish, net and unhook it, place it on the board and snap a few pics before either keeping it or releasing it back into the water. 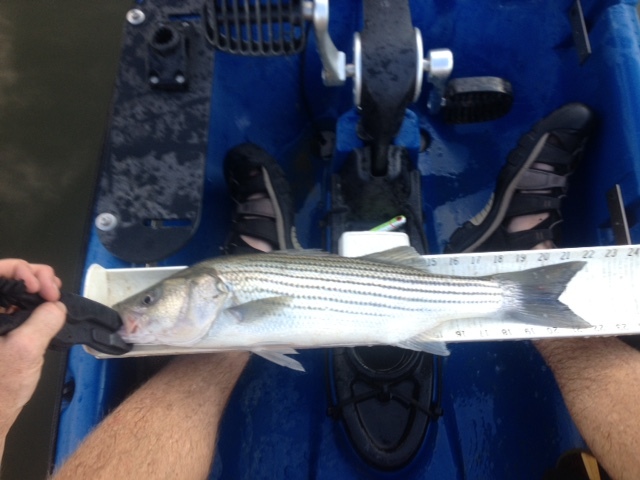 Then within a minute or two another striped bass was hooked; it was non-stop action for almost 2 hours. I wanted to keep 2 fish for the table, but after putting 2 in the cooler, one other fish was hooked deep and bled badly, so I kept it too. Now you must know striped bass are awesome table fare, but I have heard a few people complain about the meat over the years and I know why. It’s much like those who do not take the proper time with a knife with deer meat that causes the bad taste; not the meat itself. So here is a basic tutorial on how to make the most of your catch. First and foremost ice the fish down immediately! 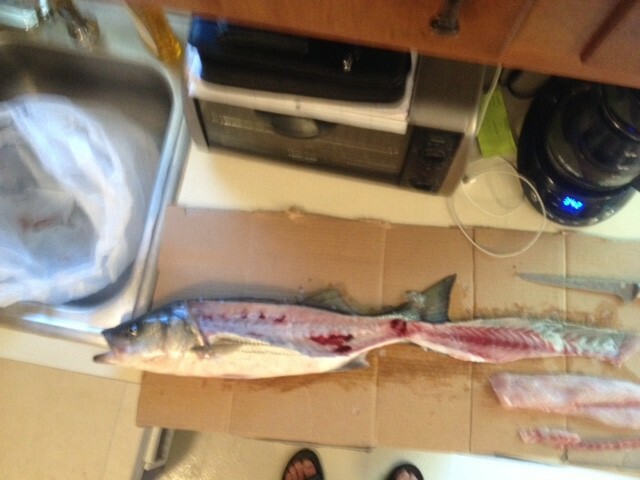 Then I prefer to let the fish stay on ice overnight as it is easier to handle and there is less blood. You may decide to cut the gills before throwing them in the cooler, but I don’t find it necessary. 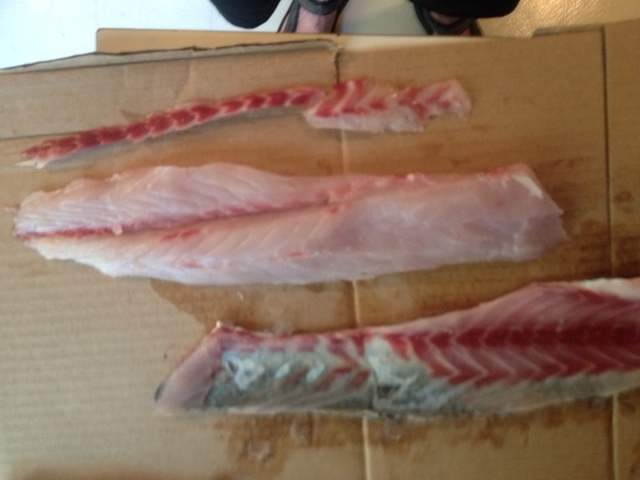 The number one reason people get a bad taste from striped bass meat is they fail to remove the dark meat. It’s really just a short strip on the fillet that you can v-notch out with a good rigid knife. See the pics below to see what I’m talking about. Note the absence of the red meat in the fillet in the second picture; the scraps are just above the cut. I like to basically fillet the shoulder down to the tail, but a very wise old-timer showed me a method years ago; leave the tail attached, and it is much easier to remove the meat from the skin (this also makes scaling unnecessary). 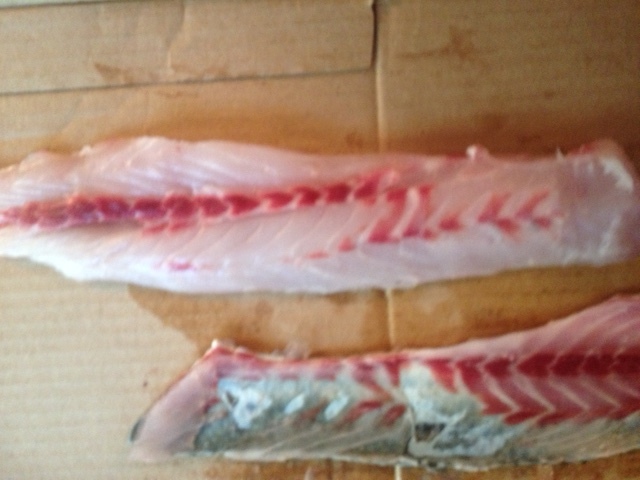 Note the skin on the cardboard in the pics above, and the tail still attached in the pic below. 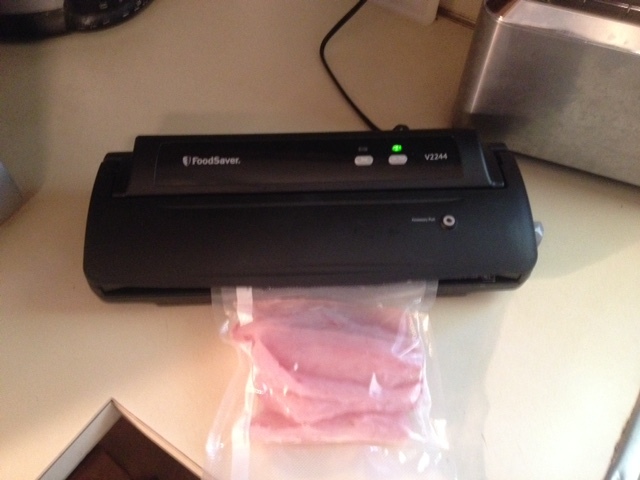 Finally, if you are not planning on eating the meat right away; I highly recommend a vacuum sealer to preserve any and all the wonderful meat you obtain from your time in the outdoors. It truly makes a world of difference in the freshness of your wild game. So get out and put a bend in your rod now, the fish are chewing!